Then I Got To Thinking...: Getting Ready On The Big Day! Getting ready for our wedding was such a fun experience. We were lucky enough to be staying in this beautiful Villa on the property of Arden Hills, which is the place we got married. We had it for 3 nights, including the wedding night. All of my closest girlfriends were there with me, along with my mom, MIL, and sisters. There were quite a few of us, but we had 4 big rooms and it was like a giant sleep-over! It was so much fun. We had a homemade breakfast prepared by an in house chef all 3 mornings. It was delicious and so relaxing to wake up to! 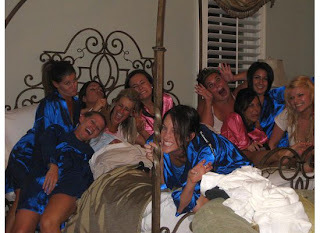 All hanging out in my bed - chatting and laughing before I went to sleep for my last single night! After breakfast we got started with some toasts before getting all ready! The girls fixing up their make up... we were spread out all over the place! 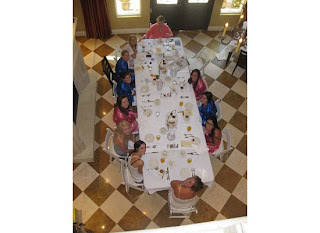 The entire Villa was taken over by girls, clothes, make up, champagne, and pearls! 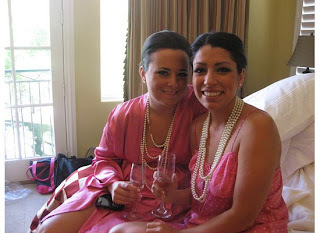 Everyone was decked out in pearls & the silk robes I got them! So cute! so beautiful. i loved your wedding dress. perfect. This looks like so much fun! What a great way to spend your last nights as a Ms.! How much fun!! The Villa is beautiful!! I still just can't get over your dress, I love it.. I want to get married again so i can wear one just like it :) Sooo pretty!! That Villa is so pretty! And your night with all your girlfriends looks like so much fun! I just love your dress too!!! I cannot get over the villa...it soooo pretty! What fun to have all of your girls there and to get ready there, I love all of your pictures! The last one of you is just precious, it is so sweet! Glad it went so perfectly for you. Happy Friday love! That Wedding dress is seriously my IDEAL wedding dress! Who made it? When my time comes hopefully i can get one similar! :oD Yall looked like you had so much fun! So happy for yall! How amazing!! I LOVE your dress!! I can't wait until my wedding day! WoW- Looks amazing! You are such a beautiful bride. The whole day/time looked like such a beautiful fun time! You look gorgeous!! That looks like so much fun I don't blame you for wanting to do it again! You looked gorgeous! i love that you hooked your girls up with robes and pearls. so fancy foo of you! LOVE! How neat that your dad made your prom dresses!! Great to have a seamstress on hand in case of emergencies! Trust me, I wanna do it all over again and again and again. In fact, I just watched my wedding video today and starting crying again like I was back in that moment. Ugh, I want to married him all over again every year. So lovely! How much fun! Fabulous place to hole up for several days with the best of girl friends! I still marvel over that gorg dress of yours. 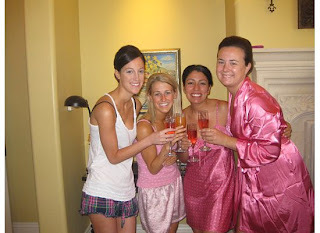 Getting ready of my girls was one of my very favorite parts too! OK can I do it all over again but in your dress! What fun pics...Your beautiful! Gorgeous pics! I still can't get over how pretty your dress is! Sounds like you had the most wonderful time. Love all those silk robes!! so sweet.. and what a clever dad you have! Your pictures make me want to be there. I'm loving the pearls on the bridesmaids. Love the photo of your Dad helping with your dress...I still think it's incredible that he can even sew, never mind make your Prom dresses! This looks like something out of a dream... or at least a movie. Wow!! I am so glad your day was so incredibly special... you will have those memories forever and ever!! And I still drop my jaw everytime I see your dress.... unreal. Wow! what gorgeous pictures of a beautiful day...a very precious picture of your dad buttoning you in! happy weekend! How FUN and gorgeous! I bet it was some of the most fun days ever! I loved the few days up to the wedding being with the girls 24/7! How cute of you to get those robes!! Looks like you had a blast with the girlies. P.S. The place is gorgeous! wow!! everything sounds and looks amazing!! and how fabulous, a chef prepared breakfast for 3 mornings! how wonderful!! all you ladies are so gorgeous!! what fun ~ by the look on your face it looks like you had a blast. There is nothing better than girl time and this is girl time extraordinaire! Beautiful pictures! You look gorgeous and I totally love your wedding dress. Just when I think your wedding can't be any more perfect, it is! Oh Tracy, you're just stunning. You just look so gorgeous and happy! Looks the perfect way to get ready for the best day of your life! Amazing dress! Love your blog! Hi lady, it is me again! Hope you had a great weekend, just wanted to let you know that I left you an award over at my blog. Hope your Monday goes well and I will respond to your e-mail soon, xoxo! what an amazing week you had! I can't wait until my own wedding day! Oh sweetie- what great memories for you and your family! You live a charmed life, woman!